This small species was first discovered on the island of Pulau Ubin some time in 2004. It was not recorded in the early authors' checklists and may have been missed due to its very small size. It is often observed puddling at sandy paths and flutters about erratically. 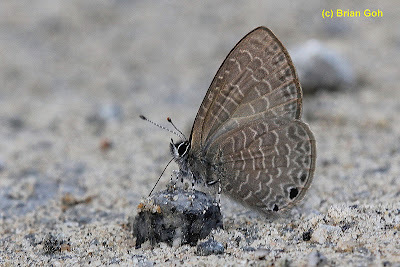 It may be confused with a few lookalike species like the Lesser Grass Blue and the Tailless Line Blue, which are about the same size and general appearance. This puddling Dingy Line Blue was again shot at Pulau Ubin by young ButterflyCircle member Brian Goh. The diminutive size of the butterfly often makes it hard to spot, unless one is very observant. The greyish brown undersides feature the usual striations with two small black spots at the tornal area of the hindwing.